My TED talk came out yesterday. As of this moment, it has had over 300,000 views in less than 14 hours. I am a bit overwhelmed. Jonathan and I are thrilled with the response. It is an honor to share our story. I have put a link at the bottom of this post. Our entire week at TED was a phenomenal experience, especially the extended time we were able to spend with the other speakers and TED staff. 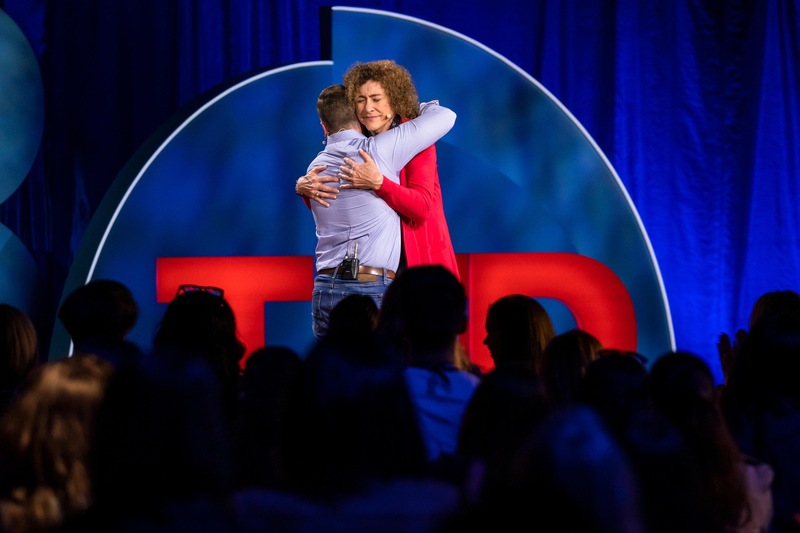 Six weeks after TEDWomen 2018, there is one memory that stands out above all others. The resort at which TEDWomen was held was a massive and beautiful complex nestled against the mountains outside of Palm Springs. Walkways and manicured gardens ushered you from one lush location to another. I often found myself on the path from my room to the green room and nearby practice rooms reserved for the speakers. On the way to the practice room I walked through a corridor with the registration area on the left and a waiting area for the entrance to the theater on the right. The corridor was always bustling with activity. The afternoon before the event began, the TED staff had been in the theater watching rehearsals all day, giving thoughtful advice and last minute suggestions. Our rehearsal in the theater was over, but I was headed back to the practice room to meet Jonathan and Briar, our TED coach, to go over the talk one more time. As I hurried through the corridor I saw a woman standing outside the theater door, leaning against the wall, looking intently at the screen on her iPhone. I stopped to watch. I could tell the woman was talking with a child, and not just any child. She was talking with a child in whom she took great delight. Her eyes sparkled and she laughed heartily at something that was said. Though the commotion around her was relentless, she was oblivious to anything but the screen and its precious image. She spoke to the child. If I listened intently, I might have been able to hear what she was saying, but that would have felt like a violation of sacred space. There was an invisible boundary around her that begged for respect. I just watched. The scene was touching under any circumstance, but to me,it had special meaning. The mother holding the phone was Helen Walters, the Head Curator for TED. Here was this woman who carried the burden of the programming of TEDWomen on her shoulders, yet she was attending to her child as if that child was the only person in the world. I loved being a father, and when you watch the TED talk, it will be obvious that I adore my son. I always have, just as I adore my two daughters. But as much love as a father might show his child, he never has the look on his face I saw on Helen’s face. Only mothers have that look. It is the look of a woman who knows every curve and ridge of her child’s body. It is the look of a mother who discerns every subtle nuance of her child’s mood, and anticipates the child’s need before the child even knows to have it. What I saw was the adoring gaze of a mother who loves with abandon, and treasures every moment in her heart. Many of those memories will be pondered years later, maybe as her child goes off to college or gets married. Who knows? Once a child is grown, there is often a far away look in a mother’s eyes, as she ponders those treasured moments from long ago. When Jonathan and I practiced on the stage at the TED office in Manhattan, I got pretty emotional giving the talk aloud for the first time. When we finished, there was applause and encouragement and suggestions. But in the middle of it all, Helen stopped everything and said, “Paula, are you all right?” She saw my tears and knew that I was, in fact, not all right. I knew at that moment that I could trust Helen and the people at TED who took such good care of Jonathan and me. There are times we get so caught up in the speed of this world that we miss the precious moments hidden in the corridors. This is what gives me hope. In spite of all the narcissism and self-serving madness in our corridors of power, we humans are going to be all right. As long as mothers tuck in their children, whether near or afar, goodness will reign and love will win. Wow. Beautiful. Opening to what is. True love. It all seems to come down to love instead of fear. Thank you. Thank you so much Stephen. Sometimes it feels that way to me too. Wow that was a great TED Talk. I didn’t expect it to move me so much as I was in your presentation at the diversity conference in Oregon. Sitting in my office with tears in my eyes. Change with acceptance is hard, change without is unmanageable. So glad you did have your son’s understanding. Stand strong. Listening to this Ted Talk and weeping at the courage of both you and your Jonathan was very impactful. Thank you for sharing this and for continuing to walk in your truth and continuing to love your sweet family and continuing to serve the Lord in new and exciting ways. I’ve learned over living many years that I don’t have to understand everything to strive to love as He loves. For that I am so grateful. Thank you so much. It is a joy to be on the journey. I haven’t seen your new TED Talk on Youtube. Is it there?I once went to Denver to Stapleton airport! You have to go to the TED.com site. It is not yet on YouTube.